Last time I talked about rebates. I stated that you should get to the store with the best sale as early as possible when dealing with rebates. Well, I failed to take my own advice and missed a great deal for a $50 Siemens 5-port Network Switch from my local CompUSA. After a $20 instant rebate and a $20 mail-in rebate my net cost would have been only $10. But as it turned out, I missed out on the deal by not getting down to the store immediately after the Sunday Sales flyer came out. I made the mistake of waiting until noon Monday by rationalizing that not many people would be in the market for a Network Switch. Today all the buzz in networking seems to be in the area of wireless networking. If you do not have a pressing need to be wireless then wired networking is much cheaper. In fact, if you have just two desktop computers you can wire network them together for next to nothing. If you have been curious about trying out networking and seeing all that it has to offer you can probably do it for less then $20 by watching the rebate ads. All you need is two Plug-and-Play 10/100 PCI Ethernet Network cards (one installed in each computer) and a network crossover cable. Note it must state that it is a crossover cable on the package. A regular network patch cable will not work as it is used for connecting a computer to a hub or switch. Network cards are usually advertised each week with rebates in the Sunday Sales flyers. The list prices seem to vary from $15 to $25. Well known brands include Netgear, Realtek, and Linksys. I got a Linksys LINE100TX network card for $5 after rebates from Best Buy. I have since seen some deals where a network card is free after rebates. For a crossover cable the best option I have seen is from Circuit City. For $4.99 you can get a ten foot Category 5e Crossover cable made by Belkin. Go to http://www.circuitcity.com/. In the Search For box for Electronics type in BLK A3X12610YLWMC and click Find. This takes you to the Product Details page. The cable is available both on the web and at your local Circuit City store. The crossover cable's RJ-45 Male connectors at each end plug directly into the RJ-45 ports on the network cards. Instructions for configuring your computer for networking is already on your computer in the Windows Help files. For more information on Home Networking, I recommend you go to a web site that has been listed on our SCPCUG Hardware Links page (http://www.scpcug.com/hardlink.html) under Hardware Information for a long time. It is World of Windows Networking at http://www.wown.com/. This is one of the best sites I have seen for getting a handle on understanding networking with the various versions of Windows. It walks you through step by step with screen capture graphics of the installation process. I find a big advantage in having my home desktop computers networked together as described above. I still have my Visioneer PaperPort scanner and HP printer daisy chain connected via the parallel port to my old Gateway 233 MHz computer (just as they originally were). Now if I need to scan a photo I use the scanner software on the Gateway computer to do the scanning and save it as a JPEG file. Using networking I can then copy or move the file over to my ABS Computer Technologies 1 GHz computer to use or process further. For printing I can print documents directly off the ABS computer as networking allows me to share the printer. Since the printer is connected to the Gateway computer, that computer must be turned on to accomplish printing from the ABS computer. Having two computers networked allows me also to back up the important files I have on each computer to the opposite computer. This gives me an added degree of safety in-between backups to CD-ROMs, should disaster happen. If you have the required software to open a file on the opposite computer you should be able to use the file as if it were on its native computer. For example, I have a large number of music (MP3 & MIDI) and movie (MPEG & AVI) files stored on my Gateway computer. As long as I have the folder containing these files on my Gateway computer defined as shared, I can open the folder from my ABS computer and play the files with the IrfanView software (http://www.irfanview.com) installed on my ABS computer. Why not make use of that old computer you stored in the closet when you bought your new state-of-the-art machine? Networking does not need to be expensive. When I bought my ABS computer in March 2001 (see my Jun 2001 Web Master Wanderings article at http://www.scpcug.com/wmwand26.html) I specifically designated a ATI Radeon VE video card because I wanted to be able to run dual monitors from a single video card. In December 2001 SCPCUG member Don Meyer was kind enough to give me an old 1996 vintage 17 inch ProView monitor that had been sitting in his closet collecting dust for a couple of years. Thank you Don. This afforded me the opportunity to try my video card's dual monitor capability. 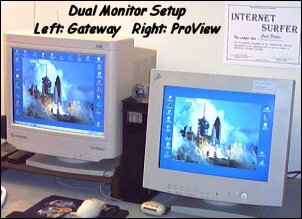 I now have two 17 inch CRT type monitors connected to my ABS computer and after using this dual monitor setup for the last six months can truthfully say I would never go back to a single monitor. Having dual monitors effectively doubles my desktop space. No longer do I have to constantly minimize, resize, or move one window in order to see another. I can move windows around at will between the two monitors. If a window is maximized it is locked to that screen. So I just make sure my windows fill slightly less than full screen and I can drag and drop from one monitor to another. If I do a screen capture of my desktop it shows one continuous desktop from one monitor to the other and that is the way it works in actual use. The mouse cursor moves from one screen to the other as if it were all one screen. Besides being convenient, this setup has saved me a great deal of time when working on things like the SCPCUG web site. I can have my HTML Editor (Adobe PageMill) on one screen while I have my Netscape browser up on the other screen. I can then immediately see the result of any changes I make. The same holds true for other projects like writing these Web Master Wanderings articles. I can have my Easy Office word processor up on one screen and my research information documents up on the second screen. This makes cutting and pasting pieces of information a snap. On the web I find it very convenient to have my e-mail client up on one screen while my browser window is open on the other. I can click on links in the e-mail and have them come up in the browser on the second screen. And since I am on 56K Dial-up it also allows me to read e-mail while waiting for some browser windows to load. Bottom line is I did not know what I was missing until I tried it. I think once you try it, you will feel the same. My ATI Radeon VE video card came with a desktop management software program for multiple displays called HydraVision. It provides for window and dialog box control, hot-key shortcuts, independent resolutions and refresh rates, and up to nine virtual desktops. You can do things like specify on which monitor certain applications will open, start applications with a hot-key, zoom in/out on the desktop or on just a monitor, insure that a window does not bridge between the two monitors, etc. I tried HydraVision but found I preferred the freedom to dynamically change things around rather than the discipline afforded by HydraVision. It's a subjective thing and you might prefer what HydraVision has to offer. The ProView monitor received from Don Meyer came with no spec sheet. I decided to do a little research so I would know its capabilities. The back of the monitor said it was Product Number PV-758R, model PV-7721M manufactured in September 1996. As expected, because of the monitor's age the ProView Technology web site (http://www.proviewintl.com/) did not even list it. Here is where a web site listed on the SCPCUG Search Engine Links page (http://www.scpcug.com/findlink.html) came in very handy. The Internet Archive Wayback Machine (http://web.archive.org/) is an absolute wonder for trying to find past information. The Wayback Machine is an archived collection of web sites dating back to 1996. It has over ten billion web pages and is the largest database in the world with over 100 terabytes. If you think it covers only commercial or business type web sites, think again. I found my personal home page from October 1998 in this enormous archive at http://web.archive.org/web/19981202054543/www5.palmnet.net/%7Ecpotsic/. As for my ProView monitor search, I could not find the exact unit but I did come close. I found the specs and a color photo for a PV1768/768 monitor at http://web.archive.org/web/19980505230027/proviewintl.com/doc/pv.html. This appears to be a later (1997-1998) version of the unit I have. Search results of course will vary depending on what has managed to get archived from the past. In any case, the Wayback Machine is a truly great resource for researching information that is no longer available on a current web site.